We know that the original and eternal qualities of the soul are love, peace, purity, happiness, truth, knowledge and powers. We may say Virtues and Powers. We also know that powers don’t mean the muscle power or money power or political power or any other physical power. These are the spiritual powers. Generally, the powers are signified by the strength in the arm and so eight hands of the shakti who are deities; known as ‘Ashth Bhuja’, show these eight spiritual powers. 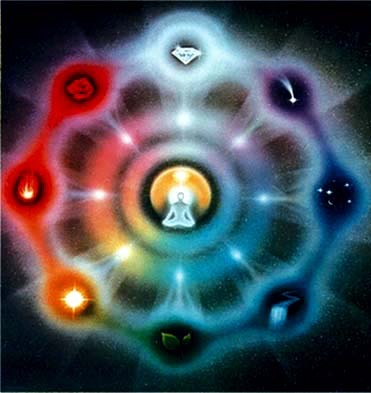 In reality there are many powers than these eight. Time also has power. It is said that Samay bada balwan. (Time is very powerful). Samay ki balihari! Time of ‘Confluence Age’ (Sangam Yug) is very special time in the world drama cycle, every elevated action we performed at this time we get 100 fold returns. Thoughts are also very powerful. It is said that God has created this world with just one thought. Many personalities, like scientists, politicians, philosophers etc. have their names engraved in the history due to the power they had in their thoughts. Their powerful thoughts made impossible into possible. e. g. Mahatma Gandhi, Mother Terresa, Martin Luther king etc. etc. They gave their life for one single thought and achieved impossible feats. The virtue like Peace, Purity, Love is also having great powers. Peace cools down an angry man, Purity can provide a shield of protection and Love can make impossible to happen. Knowledge has a great power. Knowledge gave us understanding. It guides, shows us a path and so it is known as light. Realisation through knowledge is known as enlightenment. Knowledge is also known as wealth, as it is a source of income. The powers have particular importance at this time of confluence age. In golden age the deities do not require these powers. They require only Virtues. We require powers because under the cover of powers the virtues are sustained, they are flourished. Like on a battlefield when army marches ahead to attack the enemy, it is provided with a cover of aeroplanes, similarly powers provide that cover to the virtues to fight out vices. The weak soul can’t hold virtue. It is welknown fact that if we speak one lie, subsequently we will have to speak 100 lies in support of it and even then at an appropriate time the truth will prevail. It is also preached in all religions to speak truth, then why people speak lie? Once, in my early childhood, I went to my aunt’s place. During my stay there, one day some respected personalities of that city were moving door to door to collect the donations for some worthy cause. My uncle saw them gradually approaching to his house. He then told me to tell those people when they come to his house that he is not there. Being an obedient child though I followed his instruction and told those respected elders that my uncle was not at home. However, my mind was wondering as why my uncle spoke a lie. Why he has not told them frankly that either he was poor or he didn’t believe that down the line the money will reach to the hands of the needy people (though they themselves may be honest) or he didn’t have faith that that was a worthy cause or whatever his views were. He had avoided to tell the truth and gone for the short cut of avoiding them by using me. Because he is a weak soul he preferred to follow that route. Powers are like neutralizing factor, they neutralize the effect of vices/negativity and then the positivity stands out like bright Sun after the eclipse. 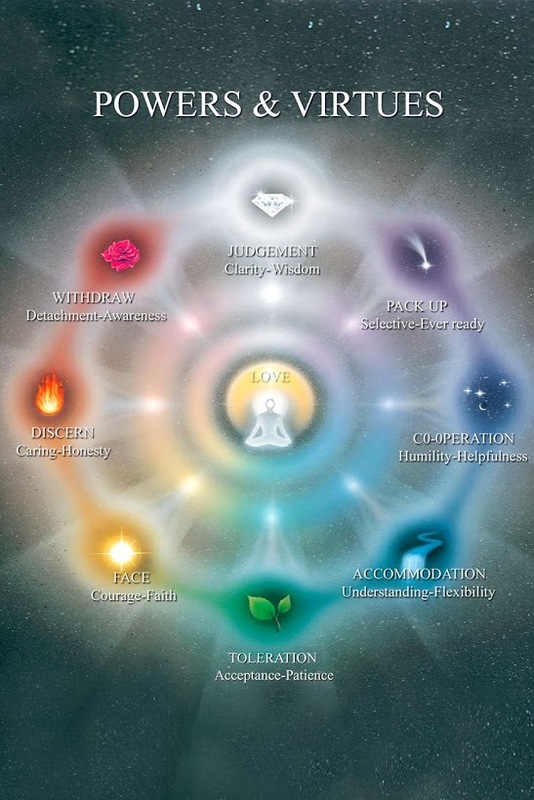 After understanding the importance of the role-played by powers in ones spiritual development let us now go into the detail discussion of the main eight spiritual powers. This power gives the ability to disengage from the world around me. The symbol used to represent this power is that of tortoise. The emphasis is on the special abilities tortoise has! Whenever a tortoise finishes search of food and eat it or whenever it sense a danger it withdraws its organs. This is very interesting and useful ability one should inculcate. Suppose, you are a group of some 8-10 people and discussing an important matter. Everyone is interested to put forward his suggestion on that matter. Whilst discussion you may sense that your suggestion lack the initiative or the merit, even then you will try to sustain it by supporting it. It is natural, because it is your own suggestion. How can you let it die! However, if you withdraw from the group mentally and take a helicopter view by allowing others to put forward their suggestions and try to analyze and understand their views and their interests, you will get the clarity of the entire issue and you will reach to the best possible solution to that issue. When now you put your suggestion it is likely that many will appreciate it as it has considered all possible aspects of the matter and so will turn out to be successful suggestion as majority will co-operate. When this repeats 2-3 occasions you will become the leader of the group. In this exercise you have developed listening ability as everyone want to put his suggestion and you have listened to him or her. As you have patiently listened to others, there is smooth discussion and no arguments; also as they have upheld your suggestion, so willing co-operation flows. So you can see how many values and virtues grow in one such incidence by practicing one power. ‘What is going to happen?’ ‘How best should I handle it.’ etc. Many a times, may be nine out of ten occasions, no such situation develops, as we were worried about. And in case it develops it sorts out of its own without affecting us. So the thoughts about future are also ordinary and negative thoughts. That is 95% of our time we are wasting in negativity. The only positive thoughts in the past is to take a lesson from whatever has happened, but to draw a lesson from whatever has happened is a matter of few thoughts and once a lesson is taken we need not waste even a single thought on it again. The only positive thoughts in future is planning and creating something. Removing this, 90% of our time goes in negative or waste. We now understand that Time is not moving forward in a linear way though we may feel it that way. It moves in a cyclic order and so we call it as Kalchakra or chourya ayshika fera. In fact all eternal things move in a cyclic order. So whatever is future now will become present as time moves and after a moment it will become past. The same past will become future once again after a turn of cycle, i.e. after 5000 years. So whatever we are going to meet after 5000 years, why should we waste our present in thinking about it? It doesn’t make any sense. So with this clear-cut understanding we should withdraw from the past and enjoy the present. So also future! We should develop an easy carefree but at the same time careful nature, instead of worry, worry and more worries! For this we may develop faith in God or on our own character. But we should not become a victim to stress, distress or depression. So the Power to Withdraw helps us to withdraw from the past and the future and help us to enjoy the present. So, the wisdom lies in saying, ‘It is a drama!’ and put a full stop to the past. It is a marvelous method to save our happiness and our cheerful state of mind from negative and waste thoughts! Happiness is our most valuable treasure and why should we allow the past incidence to rob it from us? When one has left his place for education, career or any other reason and when he has to return home again; he immediately starts withdrawing his interest from that place, people and acquaintances. Whereas it was very difficult for him at the first place to withdraw from his home and the city/nation where he lived since his childhood, due to attachment towards the people and place. Once you become detached, then you can withdraw and pack-up to move further. Here you require power to pack-up. Likewise when we have to leave this old, dirty and impure world and follow our father we have to break the attachment from this world. 2. POWER TO PACK-UP: This power follows the earlier power, power to withdraw. The Godly knowledge makes it clear to us that we are heading to destruction. Even common sense says that the extreme brings the end! Even if we see the standard of morality at our childhood and at present, we notice a sharp degradation. In those days we were hesitant to offer bribe as it may backfire, we were respecting our elders and teachers, our leaders were patriots and now within a span of just say 40-50 years where we are heading. Scientifically we may be progressing, but spiritually we are bankrupt. Baba says this impure dirty world is to be set on fire. Whatever you are seeing with these eyes is going to be destroyed. No one will be there to cremate the dead bodies. So we must break our attachment to avoid the sorrows and pain of separation. However beautiful the diamond necklace or the digital camera or any such thing may be, this is not the time to long for these things, it is the time to become a flawless diamond himself. These things may invite the unwanted guest to rob you, that is another side of the story. So, when it is time to pack up what is the idea in collecting! So, we have to become content in what we have. We should become desire less. Ichchha matram avidya. We should develop total ignorance of what desire is! We should think: Whatever I am having is needed to me and so it is given to me (by God). Whatever I am not having is not needed so it is not provided . However in future if the need arises it will be provided to me at right time. This creates faith in Him and also gives us very valuable virtue Contentment. Desires and expectation are the root cause of sorrow. By becoming desireless you are moving towards happiness. When we detach from the roles we are playing we can see our role and others’ with great clarity as detached observers. This improves our decision making ability. Detached observer can not be victim of his own emotions. The balance of ‘detached and loving’ is a very essential art of life. A father can spend years in developing a relationship with his son. When the son gets independent he wants to play a game of life in his own way. If the father sees any problem and feels the decision his son is going to make is not correct and advices against it. However son may have different views. Father may argue, plead, threaten or do whatever he feels right to change the decision of his son. Then the relationship becomes sour. However our father (God) who stays in such a far away land gives us his advice, explains the pros and cons and leaves it to us to take whatever decision we want to take. He never forces, never imposes His decision on us and we play the game of life as we want. So, we are responsible for our decision. We can’t blame God for that. Our relationship with God always remains loving. Why then physical father imposes his advice to his son at the cost of a relationship? Because of attachment. So, being detached and loving is a good method in handling relationships. When we packed up, we are detached and ready to take off. We are standing on one toe, hands are raised and another leg is in air, as if ready to fly in a next moment. So, this power makes us ever-ready, free from bondages. It makes us more alert, careful and attentive as we know that every moment could be the last moment. This world has become a graveyard as untimely death is hovering on every person. Corruption and adultration has made this world as brothel. This world is set on fire as everyone is sitting on the pyre of lust and fire of anger. This awareness creates a feeling of total disinterest and distaste for this world. This attitude of vairag/ disinterest helps us to put a full-stop to the issues as they no longer seem to be significant, helps us to mould our sanskars, put a full-stop to wasteful thinking. Meditation is forgetting body, bodily beings, possession, the entire world and stabilising in our true state of being, a spark of light and energy and stabilising in this form and forge our connection with Him who is also a beutifully radiating point of energy. Here we require both these powers, power to withdraw and power to pack-up. Withdraw from this world, come to our eternal form, pack-up and fly to whichever destination you choose; Angelic world or Incorporeal world, Land of Peace or Land of Happiness, go for Angelic stage or seed stage…….etc. Didi says – Ab ghar Chalana hai! Mamma says – Har ghadi, Antim Ghadi hai! To practice meditation we have to become soul-conscious by withdrawing ourselves from the world, worldly people and our own body, where this power is extremely useful. As we know we have come through the entire cycle, this is our last birth, last body. So after shedding this body we will return back to home. However, before returning to the sweet silence home we have to settle all our karmic account and become karmateet. It is quite natural that without using this power and responding properly and positively to the external stimuli, we will just go on increasing the karmic debt more and more. This power helps us to stall the chain-reaction of cause and effect going on and on endlessly. Now as there is no more births in this cycle I have to settle all my pending karmas in this very life. Besides, I must be careful, alert and cautious in not to indulge in any more vikarma by reacting to any condition. I can’t afford to react under slightest provocation now. The darkness of night is not going to last for ever, sooner or later the Sun will rise and bring the new rays of hope. Only have Patience! ‘Vo subah kabhi to ayegi.’ Patience always bears sweet fruits! During such time of testing we should follow the example of grass. During the storms the trees which stand erect are likely to be uprooted, but the grass which bends and allows the storm to pass on just dances during and after the storm. The ‘I’ness in me (Ego) make me stand erect like a tree and when uprooted my condition becomes devastated. So, HUMILITY is the best option. Baba says, ‘Child when you are humble you win the place in the heart of the person in front of whom you have bent. In case that soul does not bend this father bends in front of you, a humble child.’ How sweet! This is the sweetness of the father. And we get such a nice virtue free. But remember as the night is not going to last for ever so is the day! So when everything is good, sailing is smooth, you are ascending do not let the arrogance to erupt. Humility, when we are on top of the world, is required more. When conditions are bad they themselves teach us a lesson to become humble, so humility in bad days is alright, but it is more appreciated when a person has an outstanding successful life and still humble. So situations and cirumstances become real bad to teach us a lesson on humility. So every scene in the drama is beneficial. Behind the curtain of certain loss a benefit is hidden. So, Baba says, ‘Whatever happened is good, whatever happening is better and whatever will happen is the best.’ So whatever we feel whilst passing through difficult situations, circumstances, events, obstacles etc. depends largely upon our outlook towards seeing these conditions. If I am pessimistic I feel gloomy, sad, no hopes left in life. But if I look to them as a challenge or opportunity to prove my strength or a test to pass on and to move forward or just a passing game, side-scene then in fact we are benefited by way of success or getting inner strength or imbibing virtues like HUMILITY, TOLERENCE, PATIENCE etc or developing skills like ‘letting go’, ‘taking things easy’ etc. As long as we are not taking such benefit from these tests they may come again and again to teach us our lesson. Ups and down is the beauty of life. Victory and defeat, happiness and sorrow, success and failure, praise and defamation are just a part of the game. Naturally we like victory, happiness, success, praise to come in our way. But that is not always possible. When we accept praise, honor etc. remember defamation can follow. Anyway why we get praise? Because of a virtue or a speciality displayed by us in carrying out a successful job. Who has filled in those things in us? What we have done? We have just distributed the holy offering (Prabhu-prasad) to all. So if the praise comes in return of what we have done it should go to Him. So, the best policy is to direct that praise to where it belongs, by saying all praise goes to the One. (Mahima sari ek ki hai.) So as we no longer accept the praise we are free from the defamation. Within us there is still a longing for recognition, appreciation,name and fame. If it is not coming in our way we have to struggle with a lot of waste and sometimes even negative thoughts. Our sweet father says, ‘Child, when your father is chanting the rosary of your name saying ‘sweet child, sweet child’, then why you are running after name and fame from bodily beings? Even the Brahmin priests are earning wealth and respect from the people on your name! Such elevated name Baba has given to you. The highest worldly status is a throne of a king. Here, Baba is giving you a seat on His heart-throne now and world sovereignty for future 20 births. You will be returning with Baba as a bride moving with a bride-groom and that will be your marriage procession. So why bother for name and fame when God Himself is singing our praise? So defamation, dishonor can just be easily ignored, tolerated. Our heart should be like a big ocean to accommodate the attacks of others’ negativity. An ocean accepts all the water from all the rivers. It never says that your quota is finished and hence can’t be accepted today. Neither has it complained the quality of the water the river brings. It just accepts. Likewise we should accept everything and put it within us. However, it is a common observation that we accept once, twice.. even ten times, but on eleventh time we explode. Sometimes you feel that you have forgotten but it surprises you by surfacing suddenly. So all the efforts put up in the past go to vain. When one can tolerate for ten times means he has got the power of tolerance, then why he can’t tolerate for eleventh time? Why he limits himself? So there must be something wrong in the way he puts it inside. When the ocean accepts something it either goes deep within to the ocean bed, lies there for a long period of time, decomposes and nourishes the plants life there or it just throws back somewhere down the shore. When something is merged without using power to merge properly in a right way then the person explodes after his capacity to endure (tolerance limit). When we are faced with an attack of somebody else’s negativity, (In the same new year murli BapDada warned that do not try to accommodate in such a way that you become sick. Not like that.) some try to accommodate in such a way that they become sick. Their head becomes heavy. Do not accommodate within you in that way. Merge it within you with the power to accommodate. When we are affected by others negativity and we tolerate with our negative feeling like annoyance, irritation then the result we get is just temporary. We must tolerate with positive feelings, like mercy, love, wisdom etc. It is easy for parents to tolerate & merge the wrong behavior and misdeeds of the child due to love. So the right way to do it is first link your heart to the ocean (Baba) and then neutralise it with your own positivity and then merge it deep in the ocean of your heart. Then it will never surface again and surprise you. Many a times in spite of doing positive thinking courses, seminars etc. the participant comes out without understanding what is ‘Positive’. He feels all these statements are positive as they are all affirmative. The original and eternal qualities of the soul are the virtues which are positive, whereas the acquired qualities are the negativity within the soul. Power to merge and power to emerge is also known as power to remember and power to forget. However we forget what we have to remember (Soul-consciousness, Murli etc.) and remember what we should forget. So during this confluence age Baba has to brush our memory and give us our original and eternal awarenesses(Smriti). During Brahma’s night we become body-conscious and forgot almost all our beautiful virtues. By giving us the awareness of ‘who we were’ Baba helps us to emerge that memory back. This is the most important power we have. This is the power which facilitates us to recognize the incorporeal Supreme Being, God and thus makes us a special soul. Where the authorities of scripture, authorities of Science, authorities of politics, authorities of devotion, authorities of arts and crafts failed to recognize Him, we, the chosen few, the ordinary souls, recognized Him. So we are special! This power makes one as the enlightened soul!! This power facilitates the process of decision making. A money changer can recognise whether a currency note is genuine or fake just by physical touch. So also the diamond dealer can assess the value of a diamond by judging the carat and hue emitted by that diamond. How do they develop this talent? 5) the wisdom is attained. 1) Broad intellect (Vishaal budhhi) which can go through theunlimited space, through three worlds, making us Trilokinath. 2) Far-sighted (Durandeshi Budhhi) intellect which can move into time dimension i.e. the Past. Present and Future and become Trikaldarshi. 3) Subtle intellect (Mahin Budhhi) which can go deep into the ocean of knowledge and bring the beautiful pearls. When we use this aspect of intellect we can churn the Godly knowledge and get nourishment and strength from it. Knowledge is a sword and the sharpness of this sword is intellect. The sword is valued on the basis of the sharpness, (the intellect) it has. The knowledge is about purification of the soul. The strength required to practicalise this knowledge is achieved by Yoga. Yoga is a research laboratory (Vigyan) wherein one becomes introspective and churns the knowledge. This helps to increase the sharpness of the sword. There is a very faint invisible line of separation between truth and false, soul-consciousness and body-consciousness, virtues and vices etc. So the sword of knowledge with a sharpness of divine intellect is required to discriminate and separate it. It can be said that like darkness, the vices do not have their own existence. Absence of light is darkness. Likewise, absence of virtue is vice! Absence of contentment within is the greed. Absence of tolerance is anger, absence of spiritual (Soul-conscious) love is lust or attachment. We can say that the other end of virtue is vice! So to separate them requires power to discern. Truth and falsehood is a similar case. Truth, falsehood and lie! Anything that is eternal is truth. Anything that is based on perishable things is false. So, they say the world is false, the body is false, the maya is false! As we see the body, the world, etc. we can’t call it a lie. And it is not truth either as it is not eternal. So, it is false. Though we see the body and the world as real, they are neither true (eternal) nor lie, these are false! Maya is an illusion. Maya is the feminine image of vices and Ravan can be called as the mascular image of vices. Maya can take various forms, sometimes loving and caring, sometimes fearful, sometimes attractive and tempting whereas Ravan has angry and violent form. The one who has wisdom developed through a great power of discrimination can just recognize the maya approaching and act decisively to conquer it or to protect from it. We require to use this power to separate soul consciousness from body consciousness, virtues from vices, truth from falsehood, just from unjust. We also require it to select right words before speaking, right action before performing and right, elevated and benevolent thought before creating. Swan has a great power of discrimination. It can separate pearls from pebbles. It swallows only the pearls. It can separate milk from water. In the same way, it is a great art to see only goodness and not defects in others. If one sees defects in others, he can’t love or appreciate their specialties. See our father. We have so many defects that even sometimes it may become difficult for us to love ourselves. However He always loves us. How? He has a technique of seeing but not seeing! He never ‚sees’ our defects and so always loves us. Even criminals, sinners go to Him for His love and forgiveness. Everyone is welcome at his door. Baba says, even if a person has 95% defects, he still has 5% goodness in him. We should see that goodness in him, appreciate it, and inculcate it. If we see the defects, and think about his defects, that will leave an impression on our mind and sooner or later we will inculcate them. This is how thinking about (churning) others’ weaknesses becomes a means for our downfall. (Parchintan patan ki jad hai). So, to love and respect others we have to see only the virtues, qualities and specialties in them. Unless we love and respect others we can’t receive it from them either. So, discrimination is the art of seeing and not seeing. Seeing what is true and what is false, what is genuine and what is fake, what is real (Truth) and what is illusion (Maya). It is an art of hearing and not listening. In spite of studying all these powers and acquiring them, discrimination is still required to know which power is to be used and when. A time when the opponent is strong and we go ahead and use the power to face, we will only be crest-fallen. We will realize that we should have used the power of tolerance, or power to withdraw. Whereas if the opponent is weak and we use power to withdraw, instead of becoming victorious we will loose the battle because of notputting up any resistance; and if we use the power of tolerance, we will boost his confidence and allow him to become more powerful and arrogant. After analyzing and discriminating what is right or wrong, what is good or bad, just or unjust, we are now in position to use the power to judge in order to make the right decision. The symbol used for this power is a blind-folded deity holding a sword in one hand, and a balance in the other. Her feet are on top of a snake. Blind-folded does not mean that the law is blind, but that she is not influenced by anything, and even if a close relation comes in front of her, she would interpret the law and give a judgment. She will not get carried away with her feelings or emotions, and will not be influenced by the vices. The sword stands for knowledge and the edge of the sword is the sharpness of the intellect. The value of the sword depends upon the sharpness of its edge. If the edge is blunt, what is the use of such a sword? The Intellect and knowledge are both essential. The balance helps her to weigh things, see the pros and cons of the decision before executing it. A balance of law and love is very essential … A balance of Master and Child….Put your suggestion as a master and accept the decision as a child…..The balanced behavior gives maturity to the person. The snake stands for the vices. Crushing the snake under the feet means she doesn’t come under the influence of any vice before delivering the verdict. There are many choices & alternatives before making decisions. If there are no choices, it means one has to make a forced decision. This situation is not good. Like in chess, the king will be check-mated. One has to evaluate all the alternates by analyzing and discriminating them, and then selecting the right one using maturity, integrity and wisdom. This power gives us the ability to assess the quality of choices we have and select the right one. The judge has to sit on the seat of judgment. This is the seat of Trikaldarshi, one who sees the three aspects of time, the past of the issue under judgment, the present state of it and the future consequences after taking the decision and then only take the decision. Don’t judge people, but do judge their actions as a student to learn from that. You have no need to judge any person as you know that they are innately good, even though their actions may demonstrate otherwise. Instead become your own judge and judge your actions. Not with the aim to punish or feel guilty, but simply to assess, check and change. This power makes us responsible for the decisions we make. In our daily life, we have to face different situations, circumstances, events and personalities (which include both relationships and contacts). These are all pressure points, that is, they put a lot of pressure on us. Even ‚time’ adds to more pressure. We have to face many deadlines. When you handle the pressure of these external factors skillfully, you can have a smile on your face. However, when you find you cannot tackle these pressures, you will come under stress. So, stress is actually the inability to cope up with situations, circumstances, events, people (relationships, contacts) and time. You can develop the inner strength to withstand these pressures by working on yourself. It is possible to develop the self to such an extent that you are ready with the necessary skills, talents, specialties, wisdom & other resources before time, you can then with confidence face whatever the future has in store for you. Being capable and ready, you will be victorious! Such person is called a visionary! He is a leader in his field! So, to develop inner strength, one has to work on the faculties of the mind and intellect and also to imbibe the treasures of powers and virtues. The formula for victory is VIDHI – VIDHATA – SANGRAH – SANGRAM. Vidhi is the method. You need to follow the right method. VIDHI KE BINA SIDDHI NAHI. To be successful, one has to follow a method. The method is to remember Baba, our Supreme Father before starting any new venture. Then collect all the necessary documents, weapons, people, etc. beforehand. This is known as SANGRAH (collection). And then attack with determination to win (killer’s instinct). This is known as SANGRAM (battle). To be successful and victorious, you must be in remembrance of God (VIDHATA) throughout the process. Sometimes it happens that we have to carry out many jobs in a short time. We feel great pressure just thinking about the list of these pending jobs. But if you do one job after another, you will find that you have carried out all the jobs calmly and peacefully. Take a brief moment to consider the priorities, establish the link between the various jobs, and take His support. This way, all the jobs will be carried out with great ease. At death, when a person leaves his mortal coil, there are cries and grieving all around. This is natural because it is presumed that death is the end. However, an enlightened soul understands that it is not so. So, he can be of great help in bringing those souls out of their grief with the knowledge that that soul is now relieved from his sick body in which he was trapped and suffering; that he will now go to his new family and give them delight, joy and happiness, like he did to this present family. Then it is easy to let him go peacefully on his eternal journey and wish him well so that he is born in a good family. On the other side, the scene is different. Someone sees a dot at the horizon and shouts, ‚It is coming!’ The dot grows bigger and bigger … finally one sees the ship approaching. As it comes close to the shore, relations and friends notice the person standing on the deck and waving cheerfully. With joy flowing, they shout: ‚See! He is there!’ And that is death…! So, by changing your perception of an event, you can be liberated from sorrow. Then you develop courage to face challenges, taking problems as (hidden) opportunities for growth or a test paper or even game like boxing or entertainment or side scenes. Courage brings help! (from God). Therefore, this power to face gives one the ability to confront and resolve external and internal conflicts, obstacles, difficulties, hurdles and so forth by using wisdom, courage, changing perception and turning attention to the probable solution of the problem. This way you will become prasanachit (Cheerful) and not prashnachit (embodiment of questions); part of solution and not part of problem. God says, ‚Become an embodiment of solutions and not an embodiment of problems. Once the devil community was invited for a buffet lunch party. As they entered they smelled the entire house with the aroma of the delicious mouth-watering food. The table was placed with many delicious dishes. The food was offered to them with a condition attached that they can enjoy as much food as they want but eat it without bending the hand. Their both hands were placed in temporary plaster. The aroma filled in their nostrils, mouth was watering but they couldn’t eat! One of them took a piece thrown up in the air and tried to catch it in the mouth. Hi, it fell down! Again and again he tried. Many followed him with little or no luck. Finally they have to leave hungry and irritated. The deities were invited after this group. The big dinning hall was cleansed. The dinning table was fully decorated and nice dishes were placed on it. The same condition was announced. They entered with hands in plaster. Puzzled. Finally one of them picked a piece of food and put it in the mouth of the deity friend opposite to him. Everyone fed the deity sitting opposite to each other. They relished the delicacy of the food and left the place fully content and happy after thanking the host. Essence of the story co-operation helps to get rid off selfishness, develops unity, achieves success, leaves every one happy and content. Co-operation is most essential ingredient for teamwork and success. In soccer when the goal is done everyone remembers and praises the one who had scored the goal, no one even remembers the person who passed the ball to him which was then converted into a goal. That is precisely the teamwork! Play your part accurately and forget the euphoria of name and fame. Do not claim, blame or boast! Be Humble! HUMILITY! Success is one thing. To deal it with boasting/pride is another thing. To deal it with humility creates a great impact! Sachin Tendulkar is the loved by a billion people at least and the way he deals his success makes him an (international) idol. There may be quite a few people you must have come across in your life who have influenced your life by their humility. The best example is the one, who is known as Nirakari, Nirvikari, Nirahankari (Egoless). He creates a new world of total happiness, where there is no name or trace of sorrow and remains hidden, incognito. To carry out this mountaineering task He needs the co-operation of His children, the memorial of which is shown as lifting up of a mountain (Govardhan Parvat) with little fingers of all. At this point of time God needs a support of little fingers of purity from all of us. We have to co-operate at two levels, — within us the souls, i.e. within the family and with Baba. With Baba our attitude should be ‚Baba, I am happy wherever you place me. I will eat in your company whatever you feed; I will move in your company wherever you take me.’ This is the greatest co-operation we should offer. We should conduct ourselves like a puppet. He is puppetarian. We are more than safe in his hands. We are becoming instrumental to bring out the transformation within us and the entire world with the power of co-operation. This results into easy, instant and constant yoga (Sahaj yog and nirantar yog). Every finger has a different size and shape, but together they work in co-operation and a feast stands for solidarity and unity. In fact, all the organs in the body work in mutual co-operation. When in a joint family 4-5 brothers stay together with their wives, children, extended families and parents. All of them are not necessarily having same intelligence, specialties, skills and behavior. However, there is no comparison, criticism and all of them live together with great love under the authority of the old parents. Such family is known as being in heaven. Within the family, we have to stretch, adjust, mould, become flexible, and develop big heart, so as to accommodate everything and everyone with his sanskars without taking any pain but keeping a constant vision of love and mercy on others. To achieve this we require practicing sweetness, humility, mutual respect, an approach of ‚please you should be first’ (Pahale aap), love and an attitude of mercy. Secondly, we must praise generously for the contribution of the companions in service. We should never boast by saying ‚I’, ‚I’ and eat the unripe fruit. Thirdly, it should never be, ‚ If he co-operates I will’. That is business! ‚Even if he co-operates or not, I will. I will show him by my activities, my behavior what co-operation means. However he is, I must co-operate.’ This approach develops milk-n-sugar relationship amongst the service companions. The fort of unity is created. The greatest co-operation is to uplift the one who is under the influence of ghosts of evil, like anger, arrogance etc. by giving our power (Saakaash) and not by gossiping about his wrong deeds and pushing him hard on his head. It is said ‚vina sahakar, nahi uddhar’ i.e. there is no upliftment/progress without co-operation. It is also said that ‘united we stand!’ Unity is a great force!! Unity brings harmony within the group. Every individual member may not have the same abilities and capabilities to the same extent, everyone is unique, but together with each ones’ specialties it is a winning combination, it is a great force to reckon with. Ability to give time and attention, to share experience and wisdom in the service of others is great co-operation for uplifting humanity. You are product of your own thoughts!